Tendinosis is intratendinous atrophy and degeneration with a relative absence of inflammation; a palpable nodule may be present over tendon. Tendinitis is symptomatic degeneration of the tendon with vascular disruption and inflammatory repair response. Although the pathologic label tendinosis has been in use for more than 25 years to describe collagen degeneration in tendinopathy, many clinicians still use the term tendinitis to describe painful chronic overuse injury, implying that the fundamental problem is inflammatory. 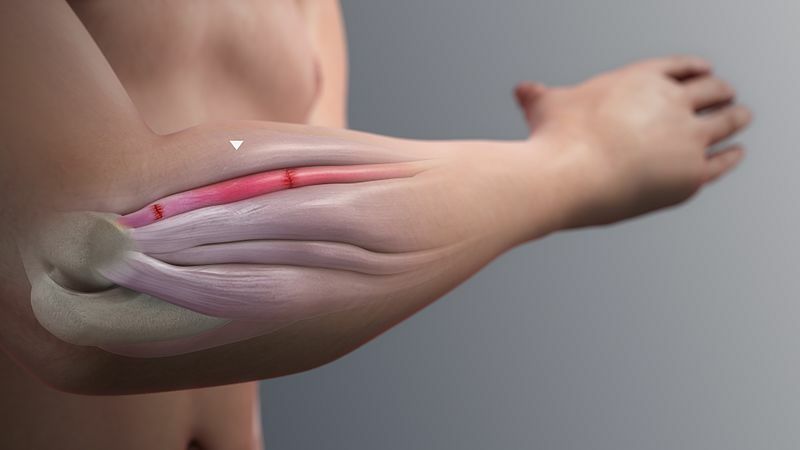 Maffulli and colleagues advocate the use of the term tendinopathy as a generic descriptor of clinical conditions such as pain, swelling, and impaired performance in and around tendons arising from overuse, with the labels tendinosis and tendinitis most appropriately applied after histopathologic examination. This nomenclature separates chronic degeneration of tendons from acute and mainly inflammatory processes, with implications for treatment and management (Table). Based on the anatomical location of the histopathological changes, it is possible to classify microtraumatic tendon injury into four types (1) tendinitis - tendon strain or tear; (2) tendinosis- intratendinous degeneration; (3) paratenonitis - inflammation of the paratenon only; and (4) paratenonitis with tendinosis. Often palpable tendon nodule that may be asymptomatic but may also be point tender; swelling of tendon sheath is absent. Symptoms are inflammatory and proportional to vascular disruption, hematoma, or atrophy-related cell necrosis. instituting early motion, beginning with passive movement and stretching, then progressing to active exercises. Eccentric strengthening. An eccentric strengthening regimen done 1–2 times daily for 12 weeks has been clinically proven to be a very successful treatment for tendinopathis, especially when the exercises are performed slowly. Eccentric strengthening is “lengthening a muscle while it is loaded and contracting. Massage. Massage stimulates circulation and cell activity, especially when done at the appropriate depth. Deep-friction massage applied to the tendon serves to stimulate fibroblast activity and generate new collagen. Nutrition. Vitamin C, manganese, and zinc are all important for the synthesis of collagen production. Vitamin B6 and Vitamin E have also been linked to tendon health. Maffulli N, Khan KM, Puddu G: Overuse tendon conditions: time to change a confusing terminology. Arthroscopy 14:840–843, 1998. Clancy WGJ: Tendon trauma and overuse injuries. In Leadbetter WB, Buckwalter JA, Gordon SL (eds): Sports-Induced Inflammation: Clinical and Basic Science Concepts. Park Ridge, Ill, American Academy of Orthopaedic Surgeons, 1990, pp 609-618.